B1 –Quattro Stagioni Grundbedürfnis + Mwst. Limited to 550 copies in sterile bags with Obi-strips. A side center label is plain black, B-side center label is plain white. 5" sleeve folds out into double-sided 6-panel insert. 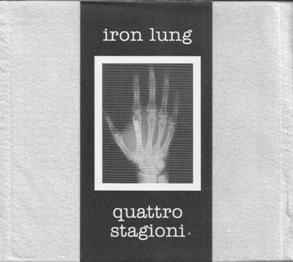 Iron Lung side recorded July 2002 at Polymorph in Oakland, CA. Quattro Stagioni side recorded & mastered in October 2002 at Massick Studios in Mimbach, Germany.